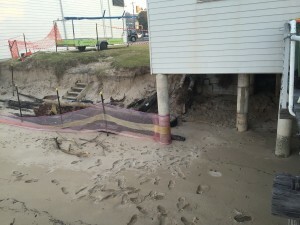 Storm surge has caused major erosion damage to the embankment under our foundations. The building we call home is in urgent need of repair. Sand erosion from recent storms has combined with natural subsidence to undermine the Unit Commander’s office, training area, and electrical room. These areas are currently cordoned off and remain unusable until we can negotiate structural repairs with our landlords. Whilst we expect the NSW government to cover the bulk of cost, we must still raise the funds to pay for engineering assessments and other preliminary activities which runs to several thousands of dollars. 10/10/15 Update: We have lodged the REF for the base repair projects with NSW Roads & Maritime Services.